Instant tachograph driver card information for drivers on the move. Digifob has been designed with driver safety in mind. By using Digifob drivers can consistently ensure they comply with EU regulations and in turn ensure that both they and other road users are safe. N.B When used along with the free to download Digifob Companion Software**DF3 can be used as a USB card reader enabling download of driver card data as a legally valid file. High Quality paper rolls specially formulated to meet the specifications required for use in Digital Tachograph Printers. Approved for all digital vehicle units. The rolls are 8 metres in length and are idividually wrapped. 3 Boxes of 3. BOX DESIGN VARIES. A durable plastic card holder which allows convenient storage and protection of your Driver Card. Keyring style. 2 GB SD Memory card, with ample storage space for driver card and vehicle unit downloads. Designs vary. Ideal tool for digital tachograph users. This popular Driver Card downloading device connects to PC via the attached USB cable. Lightweight foot for vertical desktop use, and intergrated sticky pad for alternative mounting. This card reader is fully compliant with all PC's running windoiws 2000 or above. A Card Reading device is the minimum requirement for downloading Driver Card data. You can not use this on its own you will need software installed on your computer to be able to download all card information. Handy device which enables you to take the information stored in Vehicle Unit and submit to us for storage in the format specified by DVSA. Allows you to select from 3 different download options. VU downloader with built in card reader allows user to select from three different download options: All VU, Latest VU or Card. 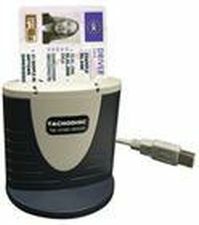 In addition to the functionality of the Digidown , this device also allows for the Driver Card to be downloaded away from the vehicle and computer. This data is then stored on the memory card, ready for transfer into the relevant software. SD memory card supplied. The complete downloading solution for both driver card and vehicle unit data, combined with the ability to view the data and infringement information. Digi-Fob Pro is a simple way to read driver card data and instantly check compliance with the majority of EU driver regulations. Digi-Fob Pro allows the user to selectively download data from a vehicle's digital tachograph, saving time on unnecessary full vehicle downloads. Digi-Fob Pro is provided with software which will allow full connectivity with a PC or laptop. This facilitates the storage of vehicle and driver card information for the purposes of analysis and compliance. Digi-Fob Pro has a large display which will allow the user to view driver card and vehicle data in real time and in detail. There will even be a number of on screen graphical reports. In the UK you are required to download vehicle units every 56 days. It is recommended that driver cards are downloaded every 28 days. This pack has been designed for an operator who needs to take control of the downloading and storage of digital information.